Frankfurt: His Highness Dr Shaikh Sultan Bin Mohammad Al Qasimi, Supreme Council Member and Ruler of Sharjah, launched the German translation of his book The Myth of Arab Piracy in the Gulf at the ongoing Frankfurt Book Fair (FBF). 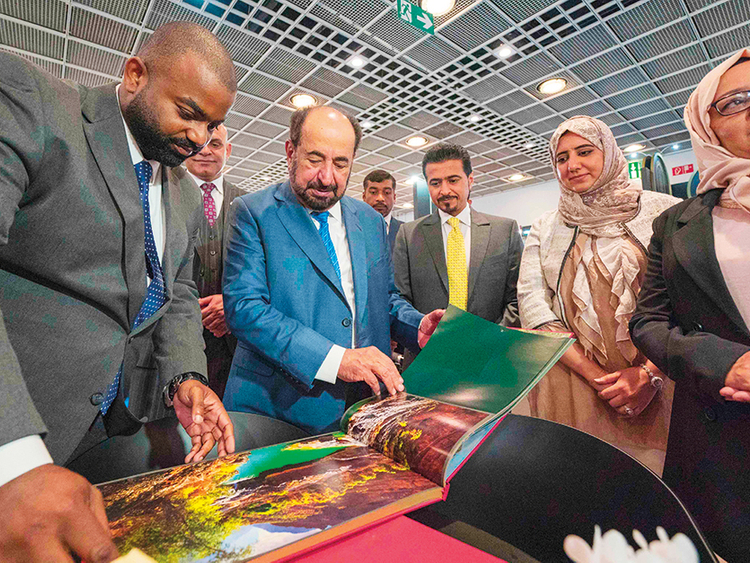 During his stop at the Sharjah Book Authority’s pavilion, Dr Shaikh Sultan met with a number of Arab and foreign literary figures, heads of publishing houses and media representatives. He exchanged views with them on issues such as the development of communities through culture, as well as the importance of boosting the role of libraries and supporting their presence in public locations, which would help increase the reach of books to all members of society. He also pointed out that stability is the cornerstone for the development of any nation. The pavilion’s visitors praised the emirate’s cultural movement and immense efforts of Dr Shaikh Sultan to support culture and intellectuals. The Sharjah Ruler then visited a number of pavilions at the fair including Saudi Arabia, Oman, Lebanon and Egypt, in addition to Emirati ones, such as the Emirates Publishers Association and the Mohammad Bin Rashid Al Maktoum Foundation. Later, Dr Shaikh Sultan attended at FBF the meeting to announce the 10th Etisalat Award for Arabic Children’s Literature. The short list will be made public at the opening ceremony of the Sharjah International Book Fair on October 31. The award has six categories: Children’s Book of the Year; Young Adult Book of the Year; Best Text, Best Illustration, Best Production; and Digital Book App of the Year.